There is going to be one of the strangest alignments when Syria becomes an even greater blood-bath. The problems will spill over into Iraq, mostly in the northern regions, and Russia is going to be dependent and thus in a strange alignment with Israel in order to slow and eventually repulse the Iranian attempts at hegemony. The other force which will be adding in no small manner will be Turkey as they attempt to sweep the Kurds off the map in northern Syria and may make a fatal mistake and take their fight with the Kurds into Iraq. The Kurdish forces in Iraq are the same forces that largely were responsible for the defeat of the Islamic State. Their major mistake was not declaring their independence immediately after the highly favorable call for the establishment of Kurdistan back with the September of 2017 referendum. The main problem the Kurds will face is their lack of adequate air forces, but on the ground they proved to be formidable fighters. Yes, we know that Turkish President Erdogan promised President Trump he would only fight the Islamic State and related terrorists. The problem is Erdogan defines all Kurds, even the infants, as dangerous terrorist forces. President Trump is fully aware that despite Turkey presumably being a NATO ally, they are no friend of the United States and that Erdogan sees himself as the great new leader who will be the initiator of the new Ottoman Empire and has designs on Aleppo in Syria and Mosul in Iraq. Hopefully Erdogan realizes that for him to take Mosul he will first be required to fight through the Kurdish forces in the North and then be required to take Mosul from Iraqi forces who are backed by Iranian forced from the IRGC. These are some of the elite forces from the IRGC which are holding Mosul. Meanwhile, the Iranian regime is facing some turbulence on the home front as a plurality of the people desire returning to Western styled Democratic governance. The Iranian economy was not as sturdy and thriving as the Europeans and others claimed it was and the American sanctions are doing their intended effect and doing so well. The slacking wages, rising unemployment, farmers facing under-valued crop prices, and retirees joining the farmers in massive demonstrations in Tehran and Mashhad (Iran’s second largest city) have shaken many a Middle East expert. There is a pair of videos plus many pictures of the demonstrations, the noisy demonstrations. These are simply the latest round of demonstrations. They are following a general worker strike, at least two of them one of which even the taxi drivers joined bringing the capital city and others to a virtual standstill. Before that was a student’s demonstration, it drew support from many workers, including salesmen and many middle-aged men who were witnessed in this set of protests. Basically, the Iranian people want to end the Islamic revolution and instead have an economic revolution which empowers them to improve their lives. Meanwhile, Iran is still making attempts, largely successful, to be the proxy rulers in Iraq and in Lebanon. In Iraq they are simply using the mostly, if not totally, Shiite government as their sock-puppet having it execute their desires which was largely behind the attacks on the Kurds which were carried out largely by militias and IRGC forces. In Lebanon, the Iranian control is far more basic. Nasrallah runs Hezballah, Hezballah basically is the Lebanese government and largely controls its military and Nasrallah takes his orders from the Mullahs of Iran. Iran also holds sway over Gaza with Islamic Jihad, their original agents in Gaza, and Hamas recently coming on-board and receiving additional rocket motors and the plans for machining additional motors providing them with enhanced range which they now threaten Haifa, Jerusalem and Tel Aviv plus all the places inbetween. The latest threats have come from the mouth of Islamic Jihad leader Ziyad Nakhalah who has been threatening that a new war is coming against Israel and this war will be unlike the failures of the past as this time Israel is going to be attacked from the north and south at the same time. One might even conclude by the way he spoke that he was including the Quds Force, a special group from the IRGC specifically trained to take Jerusalem and fight against Israel, attacking over the Golan Heights. One can be assured that during his visit to Tehran and meeting the leadership of the Iranian tyranny, he received guarantees that they would instruct Hezballah to support whatever may be coming from Gaza. He made references to the existence of numerous infiltration tunnels which Israel has yet to find and how the attackers from the North (Lebanon) would swamp the Israeli forces in the north by coming out behind them, between them and possibly within their formations and surprising the IDF and defeating them handily while taking numerous Israeli cities at the same time. Perhaps we should thank him for the warnings. This is all on top of our article from January 6, 2019, titled Iran on the Offensive, in which we discussed the intent by Iran to send warships into the North Atlantic Ocean, very likely close to the United States’ eastern seaboard. What is their intent? Well, it could be to attack the United States at the same time as they unleash their terror forces against Israel and who knows what other surprises the Iranians might have in store for the world. We know that they have worked on making EMP devices which are not nuclear in nature with a fair degree of success. We have always concluded that they must have numerous nuclear weapons by this point in time as they have been working on this since the 1990’s and this would provide Iran with an EMP device capable of potentially threatening much of the North American electrical grid. The problem is attempting to predict what a group of aged Mullahs with grandiose dreams that their forces are invincible and that Allah will double the effect of their efforts and that they are the ones who will rule the world. But there are any numbers of items which make the rulers of the Iranian theocracy even more dangerous at these times. First and foremost is the unrest at home, knowing that they no longer have the protection of an American President who believes much the same as do they. They are completely aware that President Trump would love nothing more than to assist their overthrow by their own people with minimal if any American assistance beyond providing the weapons required to the right people. Should the people take to the streets en-mass as happened in 2009, President Trump will be siding with the people of Iran, and not its leadership and the enforcement terror system upon which they rely to be a constant check threatening the people. 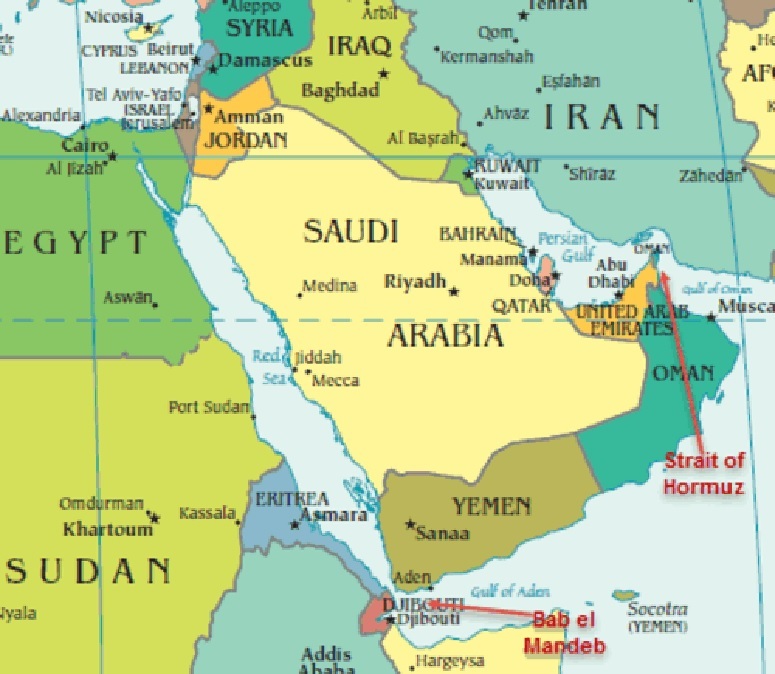 Further, they know that President Trump has turned the inhibiting of Iran curbing their meddling beyond their borders to those in the Arab world along with Russia who have the most to lose should Iran complete their Shiite Crescent and all but engulf Saudi Arabia and gain control of the Straight of Hormuz where much of the Arab oil passes and the Bab al-Mandab (see map below) choking off the Red Sea making the Suez Canal useless and destroying a large part of the Egyptian economy. Using these two choke points, Iran can cut off virtually all oil shipments from Saudi Arabia and Kuwait to the rest of the world, mostly Europe, and with the straight at the southern exit for the Red Sea, they prevent 90% of the shipping between Europe and Asia with the sole other route using the Black Sea and then overland. Of course, neither of these causes too much consternation for the United States, as she is virtually energy independent and can ship to Europe from the East Coast and Asia from their west coast and still have the Panama Canal to go between the two great oceans. Still, closing such strategic waterways would be the quickest means of provoking a war which Iran would likely lose. They are aware that their best chance is a knockout first strike decapitating the United States and then economically crippling her. The first is accomplished with a number of nuclear tipped missiles targeting both Washington D.C. as well as New York and then launching a few long-range rockets set to detonate nuclear warheads designed for low yield and a massive EMP Pulse approximately three-hundred miles above Kansas City and allow the destruction of much of the electronics across North America and the short-circuiting of the majority of the large power transformers destroying the electronic grid to such an extent that it may take as long as fifty years to fully repair and in the meantime at least three-quarters of the United States and rest of the effected regions populations will die. Before these people suffer death by any of any various means, they can be satisfied knowing that absolutely nothing of Tehran will remain and those who sent these terrible horrors onto their shores will have been hunted down and killed, possibly too quickly for many, but dead just the same. The United States Navy and other military assets around the world are more than sufficient to end this war with an American victory over Iran. The horrors come from the suffering these conflicts will bring on to so many lives. Still, there is some dark recess in the minds of the ruling Mullahs in Iran who honestly believe that by bringing such horrors unto the world that they are simply preparing the way for the Mahdi and their promised Caliphate where they will rule the world or end up with their perpetual virgins in whatever afterlife they dream over. For so many of us in the developed world the concept of conquering the world died off quite a while back and was completely destroyed by World Wars I and II. What we find incomprehensible is that there are people on the Earth today who still see themselves or those who follow them ruling the world imposing their singular religion upon every person living on the planet and if they refuse putting them to the sword, a nice way of saying kill them, even if it means sawing their heads off with a small knife and taking five to ten minutes to complete the task. The religion which the majority of those with these delusions is Islam; either Sunni or Shiite, but Islam. And, yes, there are those such as the Iranian Mullahs, Recep Tayyip Erdoğan and the Saudi Royals as well as the leaders of Wahhabi Islam, numerous different schools of Sunni and Shiite Islam and a number of dictatorial powers many of which see themselves as ruling over the final result of Communism which will prove triumphant in the end, or so they believe. There are probably a collection of other crazies who actually see themselves ruling the world, as for us, we would be glad for a small patch of the lands between the Jordan River and the Mediterranean Sea ruled by Israel. One hears rumors of deals and arrangements being touted which predicated the United States departure from Syria. One can only pray that these are valid statements but should plan as if those words were never heard. Does anybody in their right mind believe that Turkish President Recep Tayyip Erdoğan is really going to end his murdering of the Kurdish population in Syria? How many actually are able to convince themselves that once the United States has departed that Bashir al-Assad will not simply begin to slaughter not only the fighters who still oppose him in the eastern parts of the nation but will also choose a genocidal approach to the civilian populations in these regions slaughtering millions of innocents for the crime of being Sunni Muslims or Kurds. There was one promise already kept, but whether the promise was made to United States President Donald Trump or to Israeli Prime Minister Benyamin Netanyahu is unclear. The good news is that Russian President Vladimir Putin did lean on Lebanon regarding the Hezballah tunnels dug under the border and into Israel plus warned them to take steps to assure the border with Israel remains quiet. This also serves Russian influences and interests that there does not open up warring between Lebanon based Hezballah and Israel as such a war is bound to spill into Syria even if just to prevent arms from reaching Hezballah from Iran through Damascus, the route usually taken, though of late Iran has begun using Beirut International Airport to transport guidance system upgrades to the massive Hezballah rocket inventory making them deadly accurate missiles instead of launch and pray rockets with marginal accuracy. The problem is that either President Trump has not learned that in the Middle East falsehoods are a way of life and actually demanded of the followers of Islam if that lie furthers the goals of Islam. The American President is accustomed to making deals with people whose word is their bond and such does not exist throughout most of the Middle East, Israel being the exception. This has caused Israel many serious problems when dealing with the Palestinian Authority (PA) as they would often make a promise which they had no intention of ever honoring as that would be counter to their interests, and as they are Muslim, their interests when dealing with Jews is an imperative that they gain specifically when they lie. The PA has not kept virtually everything they have ever agreed upon with the greatest and most obvious lie being that they rewrote their charter removing calls to totally destroy Israel and kill all the Jews. To the credit of the PA, when Washington DC sent State Department monitors to determine if the PA was to alter their charter, they had a vote to form a committee to look into having a committee which would consider making the prescribed alterations. The State Department monitors returned to Washington DC reporting that the PA was indeed going to make the changes required, and that settled that argument. Of course, that committee saw no reason to form another committee to decide if the changes should be made, as obviously they never intended to alter one letter of their charter and nobody in the Western World can understand their charter as it is written in the apparently untranslatable Arabic. We can expect the same for any and all guarantees given to President Trump as conditions under which the United States military could leave the region-claiming job done in the defeating of the Islamic State. That takes us to whether or not the Islamic State has indeed been defeated. That would depend on one’s definition of defeated. The Islamic State lost virtually all of the territory it once held, had its declared capital city taken and has been reduced to sparse groups scattered over many square miles of territory all of whom have melted back into the population, often in the very villages they left to fight with the Islamic State. Such a dispersed group would be next to impossible to hunt down and the effort would make such more and more difficult as time progressed as many of these people would be torn from their communities leading to resentment and making more terrorists. So, was the Islamic State defeated? Well, yes, as much as such can be the case as the remainder has vanished into the countryside and in small towns and villages. The remnants if they were to gather to attempt another power seizure, they would become a simple target which could be eliminated using aircraft from the fleet in the Arabian Gulf or Mediterranean Sea as soon as they were identified. Will the Islamic State ever return and become a new menace? Probably not, or at least not in the same form with the same leadership and it would only take the name Islamic State because there is a history to be found in the ruins of the Islamic State. President Trump was basically correct in reporting that the Islamic State had been defeated, but his move to pull the troops may prove to have been premature. Reports have stated that this was a decision made by the President and only the President. Security Adviser John Bolton argued against pulling the troops out claiming it was premature. 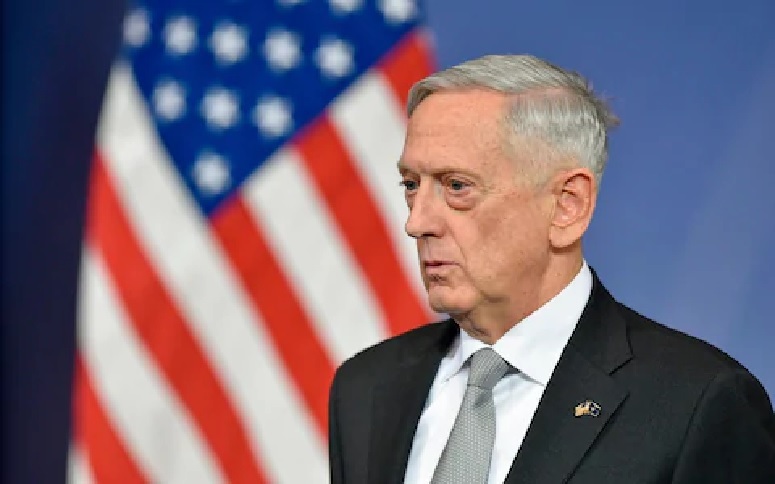 Secretary of Defense James Mattis was in so much agreement with Bolton that he tendered his resignation claiming that the President should have somebody supportive of his decision rather than himself who was vehemently opposed to this move. The leadership of the Democrat Party stated that what the President did with pulling the United States military troops from Syria was a form of deserting America’s post in the troubled region. Yes, you read that correctly, the Democrat Party is now in favor of a military campaign half way around the globe to eradicate every last person who ever had any cordial relations with the Islamic State. These are the same people who scream as if somebody murdered their pet puppy any time Israel is forced to act against Hamas, a terrorist group on the immediate border from Gaza yet bemoan the removal of United States military which was fighting terrorists extremely far removed from the American borders. That, our friends, is hypocrisy. But nobody ever honestly claimed that the United States had no double standards when it comes to Israel. Every nation, or virtually every country, holds contrary expectations of Israel which are far and away more restrictive and bordering on making it dangerous to the point of allowing Israel to face destruction while applauding any other nation taking steps for protection from terrorists even if the threat was thousands of miles distant; for example, the United States and Islamic State for whom the United States sent troops to the far side of the planet. The first and near immediate consequence of the United States pulling her troops from the region will produce will be Iran establishing a direct route across Iraq and into Syria and Lebanon with the equipment headed for Lebanon and will be utilized by Hezballah. The IRGC will become more active vis-à-vis the Israeli border with more regularly stray bullets just happening to strike somewhere along the Golan Heights and even rockets will stray into the Golan Heights all of which will make soldiering on this front more demanding. Bashir al-Assad will take the American troop withdrawal as a signal that he will be free to do as he pleases while he completes his retaking of Syria. The human rights abuses are simply going to become a major part of the coming Syrian despotic regime returning to power. Assad will definitively punish those peoples he feels were disloyal or critical of his rule. This will include the Kurds and the Sunni Arabs in large part as their Alawite Shiite leader purifies their nation. Once the perceived enemies of the Syrian despot have been cowed, then everything will return to an eerie form of normalcy. Such will take time as the people are going to have to rebuild their lives and their homes in all too many instances. Bashir al-Assad has proven to be at least as great a destroyer of worlds and has exceeded his father’s totals and Bashir is not yet near to the completion of his transformation of his nation and its population. Additionally, Turkey’s Erdoğan will be serving al-Assad by sweeping through and killing the Kurds in the north of Syria while disarming any he allows to remain. We may be on the verge of witnessing the murder systematically of millions of Kurds. In far too many cases, the military troops have been hand picked selected for their proven loyalty and their brutal oppression they are willing to inflict often on innocent persons. The anti-Kurd animosity is very apparent in both the sweeping away of described terror cells and the brutal treatment of all of those who are not them. The Kurds are also facing murderous troops in northern Iraq as the Iraqi militias, the Iraqi military and the IRGC from Iran are sweeping Kurdish territories seeking to kill anyone who ever had even the slightest connection to Kurdish Militias. This sweep may even include what is left of the Yazidis who escaped the Islamic State slaughterhouse by the skin of their teeth. Life outside of Israel in the Middle East can be horrific to the point one simply gets trampled by one despot after another. The United States departure from this region will have detrimental effects, but these will be nothing when compared to what will occur once the United States pulls their support for Israel and no longer provides cover in the Security Council. That is something which is already in the pipes and coming before you know it. Before that day arrives, Israel will require a new and kindly friend who has a permanent veto. Further discussion at the Synagogue and we discovered something remarkable about the people in power in the government. We saw that almost every minister who was in the top two to four spots, depending on the size of the representation of the party in the Knesset, they talked an excellent game and when speaking always had the right things coming from their mouths. So they obviously understand what is required as they spell it out consistently when they speak. The problem appears to be with their hands, they just cannot write down orders to follow up on what they promised. We were told during and after the last elections that there would be no more tolerating Hamas, Hezballah, or the Palestinian Authority and their lies and aggressions. We were told that terrorism and especially overt attacks such as we just experienced with Hamas would result in hard hitting military reprisals leaving these terrorist entities incapable of attacking Israel in the future. We were told how one rocket and Gaza would be swept clean and Israel would simply retain possession of Gaza after it had been cleansed. That never happened, not with the stabbing and vehicular rammings conducted by and paid for by the Palestinian Authority and it definitively did not happen as Hamas burned down square kilometers of crops, forests and wilderness preserves and fired rockets in the hundreds. Once more Israelis were forced to settle for a whole lot of talk-talk-talk and far less of actions and ending the problem. What Israel both wants and needs is a Prime Minister who does not talk very much, he makes simple, one-time statements and then follows through on those statements. The name Menachem Begin comes to mind. On June 22 1982, Joe Biden, Senator from Delaware, confronted then Israeli Prime Minister Menachem Begin during his Senate Foreign Relations committee testimony, threatening to cut off aid to Israel. Below is Menachem Begin’s priceless and inspiring answer putting Senator Biden in his place rather than trembling before imagined monsters as too many other Prime Ministers have done worrying about what the world will think, Prime Minister Menachem Begin was their lesson for how to treat the world and their reactions. Begin knew from his experiences that Israel, like the Jews have always been, would be attempted to be corrupted making it just to deny them the same rights as given freely to others and in the worst case, Jews were to be sacrificed for the general good. Began gave as good as he got and often better. He knew that were Israel to survive, she would sooner or later be going it alone, thus all foreign aid could do for Israel in the long run is make her dependent upon such funding which inevitably would be withdrawn at the worst possible moment. That would be when the world would attempt to destroy Israel. This is why we decry our continued dependence upon United States produced aircraft for the Israeli Air Force which has no indigenous designed and built aircraft. One American President deciding to end the American Israeli friendship and prevent any parts or new aircraft reaching Israel would cause a disaster unparalleled and potentially striking a fatal blow. Modern Jet Fighters require routine maintenance and replacement of certain parts on a routine schedule if they are to perform well. Take away one part and they cease to function at all in all too many instances or they become dangerous to fly. Israel cannot be beholden to another nation if survival is the main objective. This also would make Israel more freedom to act without the fear of what another nation might think or might do. Had Israel waited for the United States to grant her approval to declare herself a nation, the State Department, Defense Department and virtually every other Cabinet Secretary would have advised Truman to tell the Jews to wait, it was not a convenient time for such a decree. The Jews would still be waiting for the United States government finding it convenient for there to be an Israel and by the time they said great, it is time, all the Jews would have been murdered by the Arabs while the United States might, if the Jews were fortunate, debate the problem. For those who would claim we are being disingenuous, take a look at the Kurds who voted over 92% amongst themselves to declare their independence from Iraq and their governing body decided against doing so because the United States State Department advised them that this was not a good time to do so for the United States. 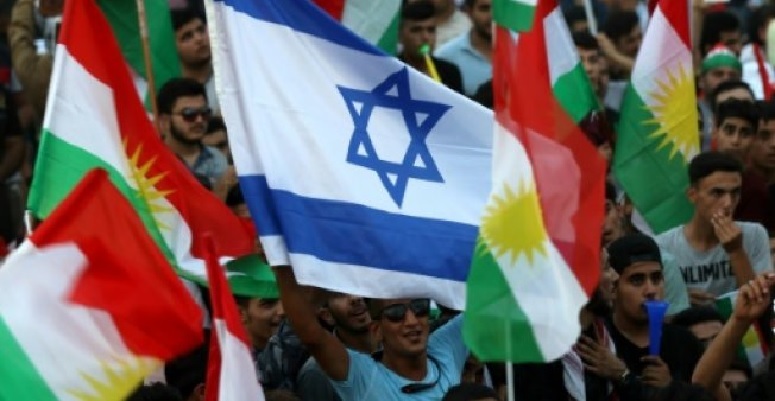 Israel fully backed Kurdish independence but the United States had warned them not to make waves as it would be inconvenient for them at this time. One can only wonder whether the Kurds asked for an approximation of when it would be a good time for the United States. We do not need think too hard to figure out the answer, not now, not next week, not next month, not next year and stop bothering us with such silly nonsense. This is why we have an Israel and the Kurds are being slaughtered by the Turkish forces in northern Syria and by Iraqi forces backed by Iran in Iraq. Thus far, it has been inconvenient for the United States to assist the Kurds any further in their life and death struggle against Turkish, Iranian and Iraqi genocidal efforts as these forces eradicating Kurdish villages are also allies of the United States, not just the Kurds plus it might prove embarrassing and thus making it inconvenient. The Kurds also required a leader who spoke with the foreign powers less and listened to the people more as then, every Kurd would have had independence and that makes a people fight just that little bit harder. We understand this in Israel as when we fought our initial war for survival which was renamed the Israeli War of Independence, which is silly, as we had declared ourselves a nation, the British were leaving, and we had independence. What we did not have was security or the backing of any major power, not the USSR, France, Britain or the United States, as all had just finished with World War II and were in no mood for another fight. They all had an excess of used equipment which they refused to sell to Israel and some ended up with the Egyptians, Iraqis and Jordanians, but not Israel. Israel did have one ally supplying bullets and other necessities, it was Czechoslovakia who probably remembered how France and Britain sliced and carved them up to appease an unappeasable Hitler at the Munich Conference after which British Prime Minister Neville Chamberlain, “This is the second time in our history that there has come back from Germany to Downing Street peace with honor. I believe it is peace for our time.” Czechoslovakia was actually far larger than Israel with the proof coming as Czechoslovakia has been divided into the Czech Republic (115th in size with approx. 30,000 sq. mi.) and Slovakia (127th and approx. 19,000 sq. mi.) while Israel is smaller than either (150th and approx. 8,000 sq. mi.) Israel’s little over eight-thousand square miles is next to nothing when compared to Czechoslovakia’s forty-nine-thousand square miles. Truth be told, when Britain’s Neville Chamberlain and France’s Édouard Daladier gave the Sudetenland to Hitler, they crippled the nation of Czechoslovakia giving away border areas greater than the size of Israel yet left Czechoslovakia still larger than Israel. This is further reason why Czechoslovakia aided Israel sending all the World War II equipment left on Czechoslovakian soil as best they were able. Allow us to conclude with two statements which we believe strongly are absolute necessities if Israel is to survive into the future. When it comes to our defense, all of our armor, rifles, sidearms, aircraft, ships, submarines and all military equipment must be designed and manufactured in Israel with easy to procure parts preferably made in Israel. Israel must not permit herself to be beholding to any other nation’s favor for our vital protection. If we must depend on outside sources, then we would be best served by having multiple sources and have their alignments not all be in one small basket such as NATO or European Union. Finally, by doing this, Israel would have more to offer on the world markets with slightly altered versions of our best equipment and we would be employing thousand more Israelis in the manufacture of our own weaponry and delivery systems. This would necessarily lead Israel to build a spaceport and develop further the Israeli missile systems to include orbital capable systems and even moon and later Mars and further capabilities. The price of such could be offset by launching other nation’s satellites for them instead of paying other nations to launch our equipment and assets into space. Our other point is striking at arms warehouses and rocket manufacturers as these are apparently easily replaced and serve as having no actual deterrence. Even striking the launchers, unless they are for the larger and more capable missiles, then you are striking at a piece of equipment where the Toyota pick up truck is the most expensive part. Single launchers can be built in any toolshed with minimal amounts of angle iron and a welding torch. Israel must consider striking higher value targets, things which would make life less comfortable for the leadership. Find out where their wives have their hair coiffed and bomb that during the night if you really must avoid casualties at almost any cost. Where do they eat out, erase the restaurants, all of them. Target the new mall, the waterpark, their homes, their vehicles with or without them inside, the arcade center, the other mall, whatever and wherever the leadership and families of Hamas and Islamic Jihad and anybody attached to them visit, destroy those places and ruin the lives of the ones giving the orders. If such as this fails to end their conflict, then the only choice left is to clean out Gaza and not allow anybody to return. Whatever the solution, the next two instances of rockets over Israel from Gaza must be the final times and never again from Gaza. Should they then shoot at Israel from the Sinai Peninsula, at least there the Egyptians will be inclined to clean them out rather than face a war with Israel. Hezballah must be informed that should one missile cross into Israel from Lebanon, everything south of the Litany River will be cleared, as will the Baka Valley and southern Beirut. That is how one ends conflicts, by letting your enemies know what will be the cost and then following through. If you cannot keep your word then nothing you say will hold a single gram of meaning.